Acer has presented a range of new Predator gaming PCs and peripherals at IFA 2017. 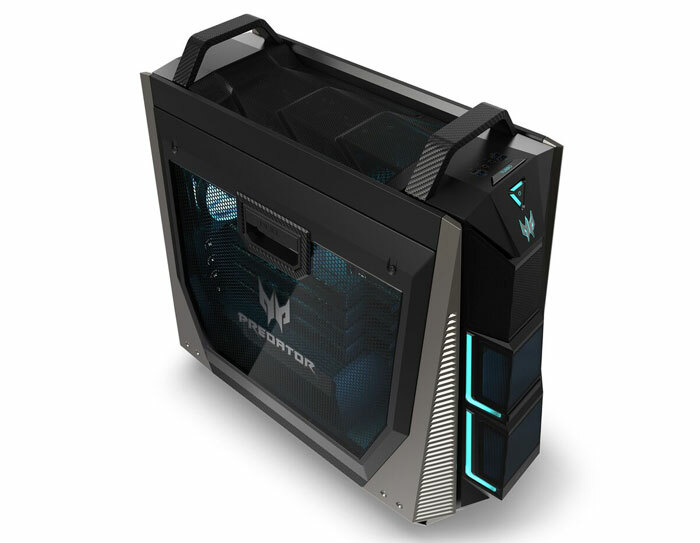 Probably the most eye catching new product is the Acer Predator Orion 9000 Series desktop PC, which Acer refers to as "an extreme platform for gaming and content creation," and it certainly can be configured into a very powerful PC. Acer also unveiled the Predator X35 curved WHQD gaming monitor, the Galea 500 gaming headset, and the Cestus 500 gaming mouse. Acer has designed the Predator Orion 9000 to "power virtual reality apps with ease" and support over 8K UHD screens. The PC can be configured with up to an Intel Core i9 Extreme Edition processor with 18 cores and 36 threads, up to four-way AMD Radeon RX Vega graphics or two Nvidia GeForce GTX 1080Ti graphics in SLI. It is overall "the most powerful PC we’ve ever made," according to senior Acer exec Jeff Lee. The exterior of the chassis is black and silver with customisable RGB LED illumination to the sides of the front bezel. On the left side is a substantial tempered glass window which shows off the synchronised lighting effects from the optional RGB cooling fans and other internal components. Keeping things cool is Acer's IceTunnel 2.0 liquid cooling system. Acer describes IceTunnel 2.0 as "an advanced airflow management solution that cleverly separates the system into several thermal zones, each with an individual airflow tunnel to expel heat". The CPU gets liquid cooling via this system and up to 5x fans positioned front top and back channel cool air over the PC components. Acer equips blower style GPUs to push warmer air out the back of the chassis. Complementing the powerful CPU and GPU choices, the Acer Predator Orion 9000 can be kitted out with up to 128 GB quad-channel DDR4 memory. For fast SSD storage the system has 3x M.2 slots. Connectivity on board includes two USB 3.1 Gen 2 ports (one Type-C and one Type-A), eight USB 3.1 Gen 1 ports (one Type-C and seven Type-A) and two USB 2.0 ports (Type-A). 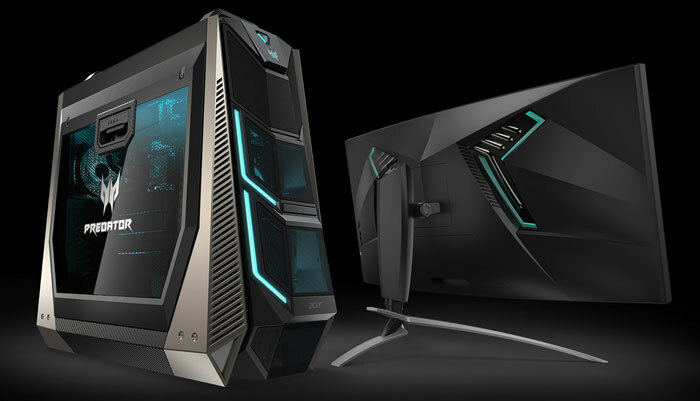 The Acer Predator Orion 9000 gaming desktops will be available in North America in December with prices starting at $1,999; and in EMEA in November starting at €1,999. This is a 35-inch gaming monitor with an 1800R curve. Acer has equipped a 21:9 aspect ratio 3440 x 1440 pixel panel with slim left/right/top bezels. 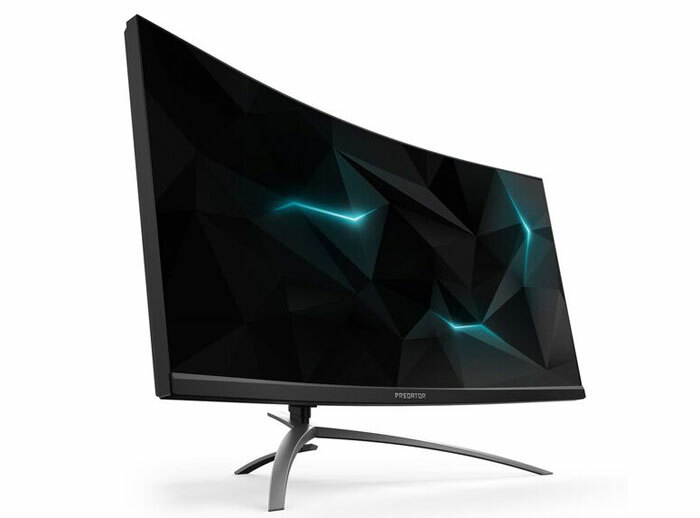 The Acer Predator X35 gaming monitor supports Nvidia G-Sync and is capable of HDR output. The VA panel offers a colour gamut covering 90 percent of the DCI-P3 colour standard, and a luminance range several times greater than that of traditional dynamic range monitors due to its quantum dot screen tech. Gamers will appreciate the fast 4ms response time and up to 200Hz refresh rate combined with Nvidia G-Sync. Predator GameView provides eight pre-set display modes to optimize visuals for different types of action as well as eco, graphics, movie and user custom mode - all selectable via OSD menu. As well as the now standard configurable Acer BlueLightShield tech to prevent tired eyes, Acer has implemented Dark Boost technology to show up fine details in dim environments. The Predator X35 display will be available in Q1 2018 but we don't have pricing as yet. Other new Acer Predator products include the Predator Galea 500 gaming headset with Acer TrueHarmony 3D Soundscape technology, and the Predator Cestus 500 gaming mouse with dual switch click pressure adjustment, RGB lighting, 8 programmable buttons and 5 onboard profile settings. The Predator Galea 500 gaming headset will be available in North America in November at $299.99; and in EMEA in November at €299.99. The Predator Cestus 500 gaming mouse will be available in North America in November at $79.99; and in EMEA in November at €89.99. Surprised at an only $2k price tag! Starting price…. that could be for a GTX 1060 and an i5… I doubt all that custom case and cooling gear comes cheap. Personally not a fan but I do love it when companies push the boat out. However it seems more sensible to paint it as a workstation rather than a gaming rig, as not only do the higher c/t chips have lower speeds, but the extra cores are useless for gaming. Then again I guess the type of people buying rigs like this do it to have the very top end part, rather than the most suitable part. The case looks like some kind of power unit from Stargate Atlantis, except given that it isn't, I am not a fan. As Tunnah said I'm happy to see someone just throw together the best system they can for consumers though. Real winner here is the X35, as long as it's built as well as it's specced. Almost makes me want to join green team.